Bredfield is a lovely village. It is handy for Woodbridge, a town I admire but one in which I couldn't imagine living, being full, as it is, of the kind of people who would live in a place like Woodbridge. But it is also close to the dozy, verdant rolling landscape where the streams collect to become the majestic Deben. It will be familiar to many Suffolk people for the elaborate wrought iron canopy with quaint, finger pointing direction boards, which towers over the village pump at the junction on the road to Boulge. Most 19th century East Suffolkers owed allegiance to the chapel rather than the church, but the Suffolk returns for the 1851 census of Religious Worship contain a very curious entry for this village. I looked it up to see if there was a precursor to this chapel, and found what was refered to as the Little (Independent Village) Meeting House. The Reverend Mr Ross, the 'Congregational Minister', declines to make any return to this paper, the congregation attending here being chiefly entered as attending elsewhere. Sunday scholars attending here in morning are mostly attendants at church in afternoon and are, I believe, entered in the church return. This must be the only incidence in the entire census of a minister talking down the congregation of his church rather than talking it up. 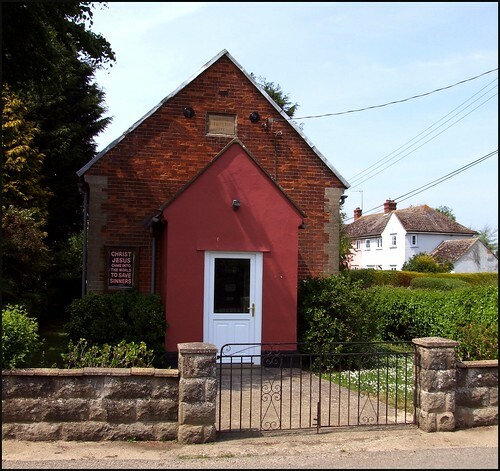 The inference must be that there was no chapel, and that the one registered in 1811 was merely an outpost of Beaumont Congregational chapel in nearby Woodbridge, meeting in private houses. This pretty little red brick chapel has an inscribed stone dated 1902 telling us that it was the Gospel Mission Room. I imagine that some enthusiastic local firebrand had achieved a following, and eventually was able to raise the money to build a permanent home for his sermons. 1902 was at the height of the Temperance Movement in England, and perhaps it is likely that this was a significant element of the community here. In Norfolk, they embraced Methodism enthusiastically, but here in Suffolk the puritan fire of the past still burned strongly enough in the bones of the average non-conformist for him to be suspicious of big organisations. Congregationalism was the brand of choice, and most of these independent chapels out in the sticks chose not to join the United Reformed Church when it came along. As independent chapels they continue today.